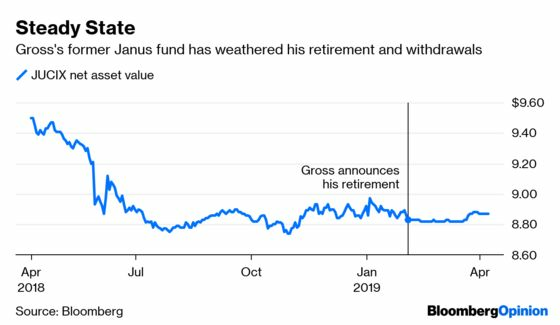 (Bloomberg Opinion) -- There will come a time in the not-too-distant future when Nick Maroutsos, co-head of global bonds at Janus Henderson Group Plc, is thought of as more than just the manager who took over Bill Gross’s former mutual fund when he retired. This steady performance is by design. The Janus website shows that some of the largest stakes as of Feb. 28 include a Treasury note that matures in October 2020, debt of Morgan Stanley and Goldman Sachs Group Inc. due in September and October, and a smattering of mortgage bonds. But more crucially, about 42 percent of the fund was in “cash and equivalents.” It seems Maroutsos was prepared for Gross’s quick exit. Surely it helped that financial markets have been highly accommodating in recent months. 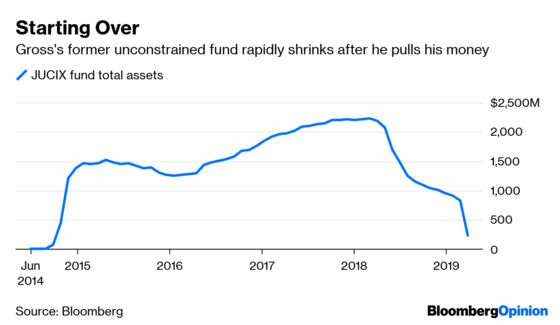 The next few months will be even more interesting now that the fund has downsized and is presumably less flush with cash. While the holdings as of the end of March aren’t public, Maroutsos has said the absolute return fund is going to follow some of the same strategies as the Janus Short Duration Income exchange-traded fund, known by the ticker VNLA (which he pronounces “vanilla.”) “We’re looking to hit singles and doubles. We’re not going to be that massive return generator. We’re going to be your risk reducer,” he told Gittelsohn. Maroutsos’s vision for the fund is far different from the previous “unconstrained” strategy. As I wrote in January, just weeks before Gross announced his retirement, the fund appeared to be employing a hedge-fund play known as “merger arbitrage.” He had an overall negative portfolio duration even though he simultaneously acknowledged that interest rates wouldn’t move much higher. At one point, I had to ask what he was even betting on anymore. With Maroutsos, it’s a more straightforward answer. He’s going to invest around the world. He’s going to take opportunistic bets on volatility in interest rates and foreign exchange. The fund’s performance is measured against the three-month London Interbank Offered Rate, and he seems inclined to find a way to steadily outperform that benchmark, rather than go for broke, as Gross said he sometimes felt compelled to do. You might call that a plain vanilla sales pitch. But so far, it’s getting the job done.